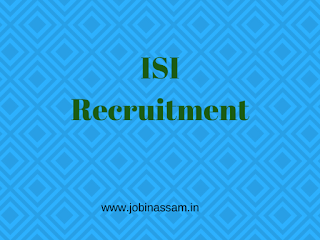 Indian Statistical Institute invites applications from eligible Indian Nationals for recruitment for the following posts at Kolkata, Delhi, Bangalore, Chennai, Tezpur, Hyderabad and Giridih on Direct Recruitment Basis. institutions out of which 5 years should be in the scale of pay of“15600-39100 and grade pay `6600 or above. practices including use of computers in all functional areas of management would be considered as an added qualification. A good Bachelor’s degree with degree/diploma in management or other equivalent professional qualification. Minimum 10 years of experience in the supervisory position in Government, public sector undertakings, autonomous organisations or in reputed academic/educational institutions out of which at least 5 years should be in the Pay Band of `15600-39100 and grade pay `5400 or above. Thorough knowledge of Government rules and regulations is essential. Familiarity with the use of the computer in all functional areas of management would be considered an added qualification. qualification. At least 5 years of experience in supervisory level in the Pay Band of `9300-34800 and Grade pay `4600 or above in Government, Public Sector undertakings, autonomous organisations, reputed academic/research Institutions. Thorough knowledge of Government rules and regulations is essential. years of experience in supervisory position (in the Pay Band `9300-34800 and Grade pay `4600 or above) in Government, public sector undertakings, autonomous organisations, reputed academic/research Institutions. Thorough knowledge of Government rules and regulations is essential. Familiarity with the use of computers in accounts would be considered as an added qualification. A good BE or equivalent degree in Civil engineering. Two years experience is desirable. School Final or equivalent with ITI Certificate or equivalent and with permit equivalent to Electrical Wireman’s Class (i) (b), (ii), (iii), (iv). Class VIII with ITI certificate of trade of electrician or equivalent or School Final or equivalent. Shall possess lift operator’s licence and permit equivalent to Electrical Wiremen’s Class (i) (b), with at least five years experience in routine maintenance and operation of lifts in a reputed institution/company. Higher Secondary (10+2) with knowledge of telephone operation in EPABX/other systems and one-year experience. Trade Certificate and knowledge of computer operation desirable. School Final or equivalent and ITI Certificate or equivalent in plumber trade with one-year experience in different types of functions related to plumbing. School Final or equivalent with ITI Certificate of Binder trade or equivalent with one year experience. relevant subjects or in a relevant vocational stream with one year’s training/experience in relevant field. Knowledge of computer operation and data entry essential. Eligible candidates can apply online through the website www.isical.ac.in from 19-09-2017 at 12:00 hrs to 17-10-2017 at 16:00 hrs. Send the printout of application with relevant documents. On the top of the envelope should be superscribed as “Name of the post—-” by post to the Senior Administrative Officer, Personnel Unit, Indian Statistical Institute, 203 B.T. Road, Kolkata – 700 108 on or before 03-11-2017.